Hahaha. You thought Cheney worked for you? Saudi Arabia is so concerned about the damage that the conflict in Iraq is doing across the region that it basically summoned Vice President Cheney for talks over the weekend, according to U.S. officials and foreign diplomats. 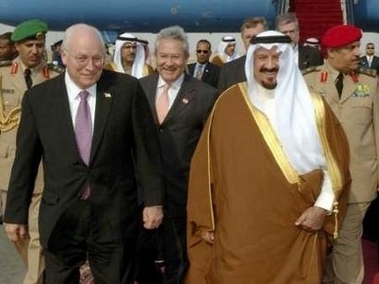 When the sultans of oil say jump, Cheney asks how high. You thought otherwise? Just asking.